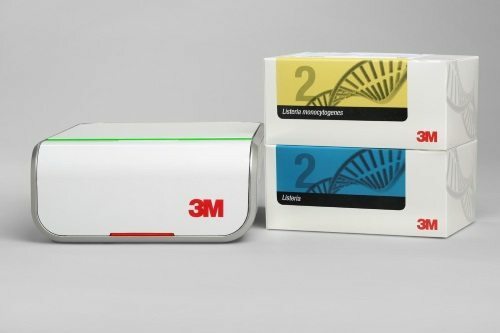 3M Food Safety releases the next generation of 3M Molecular Detection Assays that has isothermal DNA amplification and bioluminescence detection. The 3M Molecular Detection Assay 2 – Listeria and 3M Molecular Detection Assay 2 – Listeria monocytogenes are applicable to environmental samples and food types such as dairy products, ready-to-eat and raw meats, fish and seafood, fruits and vegetables. Using a standard enrichment medium, the next generation assays for Listeria and Listeria monocytogenes provide time-to-result after 24 hours of enrichment. These assays use a streamlined workflow that is 30% faster than first generation assays, enabled by new lysis chemistry that utilizes proprietary 3M nanotechnology and features a color-change indicator for increased control during assay processing. This results in fewer steps for pathogen testing laboratories without compromising accuracy. The first and second generation assays can be run simultaneously using the same 3M Molecular Detection Instrument. In order to use the new assays on their existing instrument, users need to download and install a free software upgrade. The software enhancements feature a redesigned user interface and new features that allow for easier, more efficient data entry and improved administrative control. 3M Food Safety will display the new solutions at the International Association for Food Protection 2015 Conference in Portland, US through July 28, 2015.